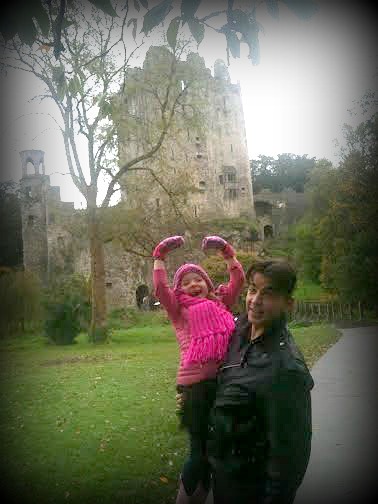 Yesterday, my husband and our six-year-old daughter, Lulu visited Blarney Castle – just a few minutes’ drive from our newly adopted home of Cork, Ireland. In case you have been living under a rock and don’t already know, the 600-year-old fortress is famous for a particular piece of carboniferous limestone with the legendary power to instill the communicative gift of Blarney upon anyone who kisses it. 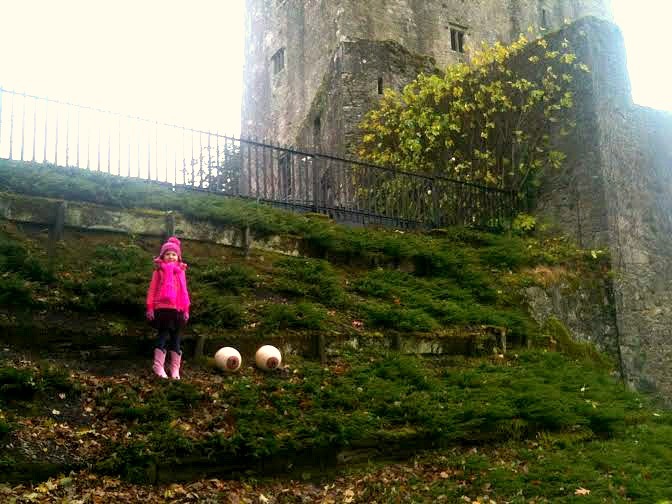 Blarney, as defined in humorous postings in and around the castle, is very distinct from Baloney. To reach the stone in question, you must first climb 110 narrow, slippery-from-Ireland’s-perpetual-autumn-mist stone stairs to the top of the castle tower. Yes, you have to climb to the tippity top! Once you reach the top, you then must turn and face away from the parapet and kneel backwards looking out high above the green rolling hills of the valley. Next, begin to stretch your body – almost back-bend-style – against the castle wall. Baloney, they say, is telling a 50-year-old woman she looks 18. But Blarney is asking an older woman how old she may be, because, as you tell her, you want to know at what age women are most beautiful. A friendly Irishman (yes, that’s redundant) named Dennis helped us put one hand on each of the two metal support rails to steady ourselves as we stretched our heads downward to the extremely difficult to reach gift-giving stone – and smooched away. Whew. 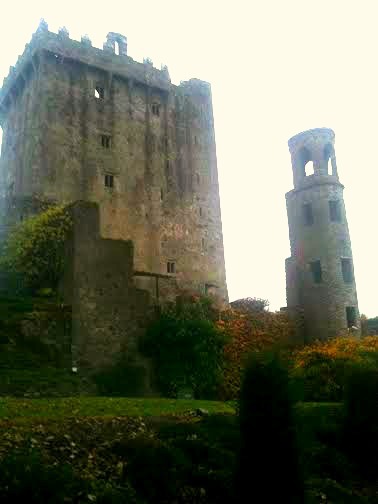 So, the perilous gymnastics required to kiss the Blarney stone were well-worth it. Except for our six-year-old. Lulu said she already knows how to talk a lot and will kiss it another time. Truer words may never have been spoken. And that’s no blarney. Here’s looking at you from Blarney Castle! Copyright 2014 Gina London. All Rights Reserved. I tell you, Lulu you are seeing everything on Earth in these young years of yours. and you are lucky to be able to see the world.. you are a lucky young lady..
You have the best adventures. I’ve always wanted to visit Ireland-my father’s family came from around Cork. You have the best adventures too! If you come to visit the land of your heritage, I promise I would be delighted to show you what I’m discovering here in Cork! Baci!